from their sneakers, shoes and boots. 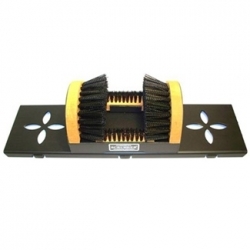 Made of solid construction right here in the U.S.A.
Portable base to keep Scrusher in place when cleaning footwear. Six rubber feet prevent scratching. Side bristles are made of softer poly, won?t scratch shoes. Bottom bristles thoroughly clean soles of footwear. Affordable, makes a great gift.